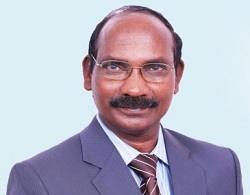 Dr. K Sivan studied BSc, Mathematics, Madurai University( 1977), B.Tech, Aeronautics, Madras Institute of Technology, Chennai ( 1980) M.E., Aerospace, IISc, Bangalore(1982) and PhD, Aerospace, IIT, Bombay, 2007. He joined ISRO in 1982 and was inducted into PSLV Project. He is specialized in Aerospace engineering, Space Transportation Systems Engineering, Launch vehicle and mission design, control & guidance design mission, simulation software design, Mission synthesis, simulation, analysis and validation of flight systems. He has significantly contributed towards end-to-end mission planning, design, integration and analysis. His innovative contributions, particularly the strategies adopted in mission design enabled the consistent performance of PSLV. This has also proved to be a good foundation for other launch vehicles of ISRO, like, GSLV MkII & MkIII including RLV-TD. He is the chief architect of 6D trajectory simulation software, SITARA, which is the backbone of the real-time and non-real-time trajectory simulations of all ISRO launch vehicles. He is the primary developer of the day launch wind / biasing strategy which has enabled all weather launches . As Project Director, GSLV – he is responsible for resolution of design issues and making GSLV operational, including the flight testing of indigenous cryogenic engine and stage-4 successful GSLV Mk II launches. He led the Flight testing of SCRAMJET engine, as well as technology demonstration of the re-usable launch vehicle (RLV-TD). He evolved a cost effective strategy for Mars Orbiter Mission (MOM) launch using PSLV. He was the chief mission architect for successful launch of 104 satellites in a single mission of PSLV. He has established Mission Synthesis and Simulation Facility, Parallel Computing Facility and Hypersonic Wind Tunnel Facility for ISRO’s launch vehicle program. He initiated technology development programs for Li-Ion cells, electric propulsion as well as advanced avionics for ISRO’s launch vehicle program. Li-Ion cell and electric propulsion is inducted into Launch Vehicles as well as Satellites. Positions Held : Director, VSSC (2015-2017), Director, LPSC (2014-2015), Project Director, GSLV (2011-2013), Member, Space Commission (2016-2017), Vice-Chairman, ISRO Council (2016-2017). Awards & Honours : “Shri Hari Om Ashram Prerit Dr.Vikram Sarabhai Research Award”, 1999,ISRO Merit Award, 2007,“Dr Biren Roy Space Science and/or Design Award”, 2011, Distinguished Alumnus Award from MIT Alumni Association, 2013, ISRO award for outstanding achievement in 2016, Distinguished Alumnus Award from IIT-Bombay, 2017, Doctor of Science (Honoris Causa), Sathyabama University & Dr MGR University, Chennai.